Eat. Live. Laugh. and sometimes shop! : Forgiveness. I've heard it said, "Forgiveness is like spinach. You might not like the taste, but it's good for you." I recently had the opportunity to "chew on" this wisdom. Sometimes we need to forgive a friend. Sometimes we need to forgive ourselves for not being who we want to be in a moment with our children or in a relationship with a friend or our spouse. Often we are hurt or we hurt. Anger rings in our ears. Judgment covers our mind and clouds our vision. It is so easy to go from that cloudy state straight into an attitude of continued unforgiveness. Living in such a state, however, will corrupt our hearts and minds. It will seep into the crevices of our very being and allow bitterness and resentment to fester and take root. How many people do you know that live in such a state? Too many, I fear. And why is forgiveness, freely given, so out of vogue? Why do we feel we can be happy by simply cutting those people who hurt us out of our lives? It seems as if our culture is caught up in *feeling good* at the expense of living well. Feeling good will not last. The issue will rise to the surface the next time we face the friend who hurt us. Or the next time we scream at our children in frustration. Feeling good will not last. We cannot simply eradicate people or events from our lives and minds. We have to chew the spinach and swallow. Chew and swallow. Only then can we live well. And find true and lasting happiness. Forgive as many times as it takes. Forgive yourself. Forgive others. Pass out forgiveness like Halloween candy. Give it freely. To everyone. 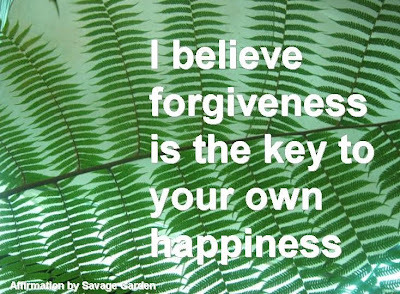 On the other side of forgiveness is a freedom that can only come from a free heart. Has someone hurt your feelings or been unkind to you? 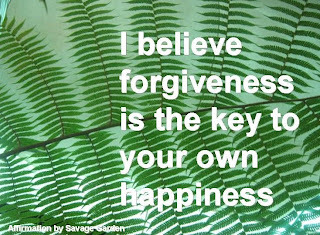 Have you withheld forgiveness from yourself or others? What is stopping you from forgiving freely? thanks for this and being an ear:) love that about you! your awesome!